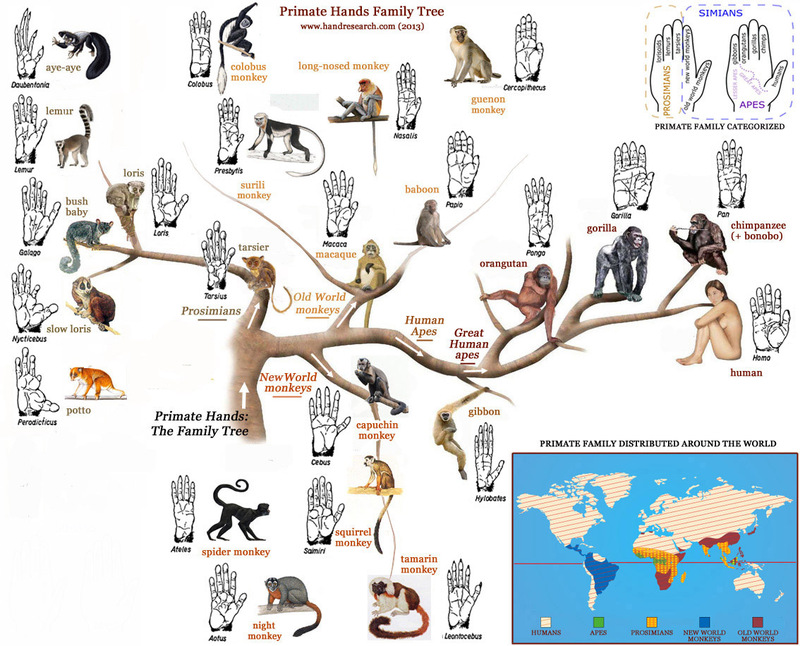 The Primate Hands Family Tree! 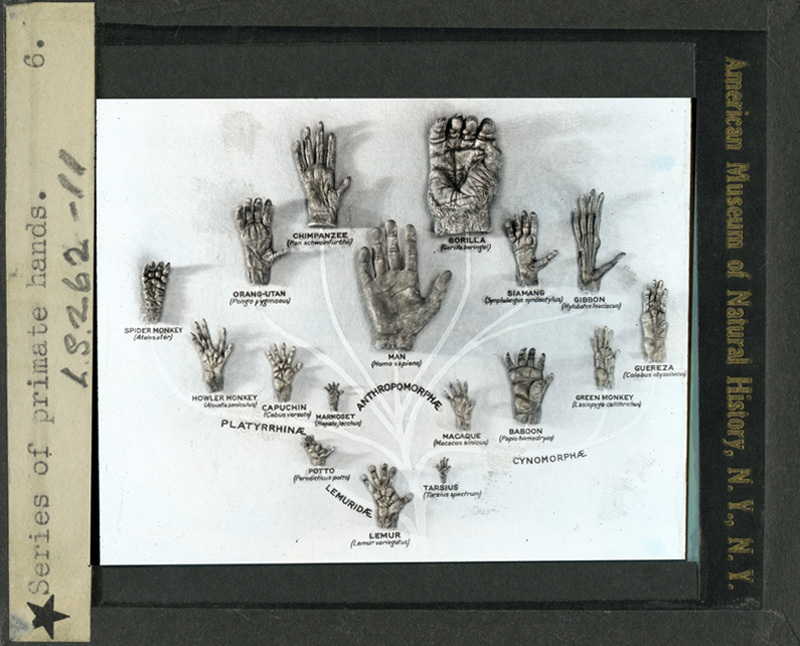 Primatology Palm Reading: The Primate Hands Family Tree! The human hand and the non-human primate hand share a number of general characteristics; however, each primate sub-family species actually has it's own unique characteristics! This article presents an overview of the common characteristics seen in individual primates species, plus how these are similar or different to the human hand. Primatology palm reading gives us a better understanding about how behavior is resulting from structure & function. Can the hand structure signal anything specific regarding behavior? INTRO - GREAT HUMAN APES - GIBBONS - OLD WORLD MONKEYS - NEW WORLD MONKEYS - TARSIER - PROSIMIANS - BEHAVIOR? At a glance, the human- and primate hand have simialar characteristics. Both show the mammalian characteristic of having 5 digits on each limb (pentadactyl) plus a number of characteristics that relate to ability to grasp and perform some other manipulative functions. However, there are several differences which set the human hand apart from the primate hand. And each primate group also has various typical characteristics! 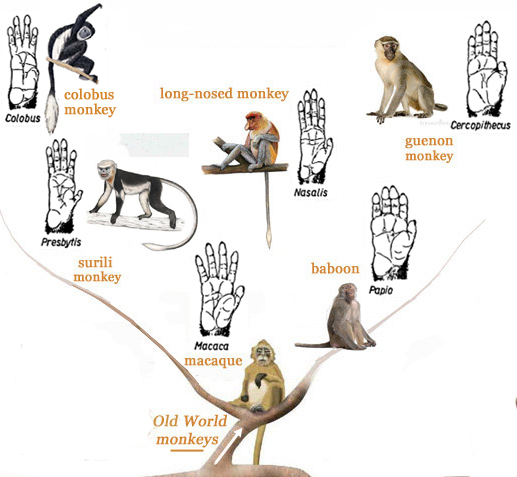 In order to understand the typical characteristics of the human hand better, it is also interesting to take a closer look at how the various primate groups have spread around the world. PRIMATES LIVE NEAR THE EQUATOR! All primate species show a tendency to live at locations near the equator (see picture on the right). Human kind found it's way to survive at (cold) locations far away from the equator; but other 'human apes' (such as the chimpanzee, bonobo, gorilla & orangutan) are only able to survive in the wild in tropical or subtropical forest near the equator. However, Old World & New World monkeys appear to have better survival skills than most human apes (only human kind is outperforming the monkeys). And in the earlier primate classification - which became outdated since 1986 - the so-called 'prosimians' (= lower primates) tend to live more closer to the equator than the so-called 'simians' (= higher primates, including: New World monkeys, Old World monkeys, apes and humans). PRIMATE RING FINGER CONFIRMS THE NEW PRIMATE CLASSIFICATION! During the 20th century the classic primate classification seperating 'prosimians' vs. 'simians' became disputed. It took untill 1986 before the tarsier (formerly known as a 'prosimian' known as the smallest primate living on earth!) became recognized as a sister group to the 'simians' due to DNA related evidence. As a consequence the tarsier became grouped together with the 'simians' (including humans) as the infraorder 'Haplorrhini'; and the non-tarsier prosimians became grouped as the infraorder 'Strepsirrhini' (which includes: lorises, bush babies, pottos & lemurs). Interestingly, the hand of the tarsier primate (see top picture) fully confirms that it varies significantly from the typical 'prosimian' hand morphology! 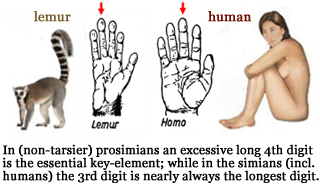 Because 'prosimians' nearly always show the tendency for the 4th digit (ring finger) to develop as the longest digit, while in simians the 3th digit is nearly always the longest digit - see picture on the right! PRIMATE FINGER LENGTH VS. HAND SIZE! The tarsier also became known as the smallest of all (known) primates living on planet earth, and their hands size is accordingly the smallest of all in terms of absolute proportions. However, in the perspective of limb length their hands are relatively large; in terms of full body proportions tarsiers probably even have the largest hands of all primates - though this can for a large part be attributed to the relatively long digits which are much longer than the length of the palm! This concerns actually a very unusual characteristic for a primate species, though the same characteristic is also seen in the aye-aye - another 'prosimian'! HAND PROPORTIONS & DOMINANT BEHAVIOR! A reversed tendency is seen in the primate species known for having the largest hands of all primates: the gorilla! Though the gorilla (just like the tarsier) has large hands relative to it's body proportions, in gorillas the fingers [digits] are much shorter than palm breadth. There is only one other primate species which shows the same unusual characteristic for a primate: the baboon! Interestingly, both the baboon & the gorilla (both have short fingers & relatively broad palms relative to palm length) are known for high percentages of non-food related aggression behavior. NOTICE: a significant percantage of aggression in primates occurs as male-female agonism during feeding competition. In the industrialized West food has become a rare motive in human aggression, which implicates that most agression in humans is non-food related. However, in non-human primates food-related aggression is common: 5%-20% in gorillas, 18% in chimpanzees, 20% in baboons, and 63% in capuchins. In most other primate species the percentages are likely even higher: aggressive behavior in primates is typically resulting from the need for food: an example of 'survival of the fitest'. New World monkeys are known to live in more "loosely organized social groups in which individuals are rarely aggressive and dominance behavior almost absent". MALES HAVE 'DOMINANT' HAND PROPORTIONS! Human finger length to palm breadth ratio is only longer than finger length to palm breadth ratio in gorillas and baboons. And the average human palm breadth to palm length ratio is only higher in the gorilla's hand; all other primates have a lower palm breadth to palm length ratio compared to the human hand! Interestingly, assuming that human kind together with gorillas and baboons can be recognized to represent the most aggressive primate species (though chimps are also known to have a violent nature as well), this evolutionary perspective could very well explain why in nearly all primates species males show some kind of tendency to dominante females. Because when comparing the proportions of the hand between males and females, the female hand is typically not only smaller... the female hand also tends to be featured with longer fingers + a more narrow palm (in absolute and relative terms)! In 2009 scientists in Indonesia reported the rediscovery of three specimens of the pygmy tarsier, a nocturnal shy creature about the size of a small mouse. Pygmy tarsiers rank among the rarest of the many tarsier species in Asia and the Pacific, and in fact some primatologists had written them off as extinct. In the media these little primates were described as 'real-life Furbys'! The tarsiers (together with the marmosets & tamarins) are also said to have served as a role model in Roald Dahl's first children's book 'The Gremlins' (1943). 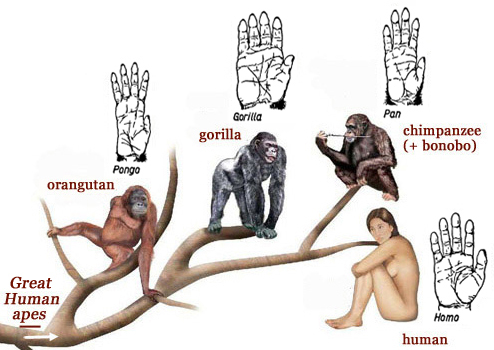 Hand proportions in various primate species (e.g. human, gorilla, chimpanzee, orangutan, gibbon, baboon, macaque, capuchin & tarsier). All human apes (Hominidae or great apes) have the typical 'simian' digit distribution: the 3rd digit is the longest of the 5 digits. And humans have the longest 3rd digit length to palm length ratio; however regarding 3rd digit length relative to palm width chimanzees and orangutans have a higher ratio than humans (gorillas have the shortest 3rd digit length regarding both dimensions). Orangutans are known as the most arboreal species among the human apes; orangs tend to locomote in tries. Regarding the distribution of digit lengths, humans have the longest thumb; and only in humans the thumb is usually longer than the pinky finger (3D > 4D > 2D > 1D > 5D). In the other human apes Sorell's digit formula usually applies (3D > 4D > 2D > 5D > 1D); though especially in organgutans & gorillas the pinky finger is sometimes slightly longer than the index finger. Humans have the highest 2D:4D digit ratio (0.95), and bonobos have a higher ratio (0.94) than the other human apes (0.91); gorillas and orangutans are suspected to have a slighty lower 2D:4D ratio than chimps. All human apes have low-set opposable thumbs, and they are all able to use their hands for gathering food or nesting materials, and, in some cases, for tool use. However, only humans have fully opposable thumbs; only the human hand is capable to make digit axis rotation resulting full pad contact between the thumb and index finger. Combining all these features, the hand of the chimpanzee (and especially the bonobo) displays the most human like characteristics; they are also known to be more capable of making the typical human 'precision grip'. However, the relatively long thumb plus the very short fingers and the square-palm in the gorilla have also been associated to represent human-like manual characteristics; however the gorilla has never been observed spontaneously to attempt tool use - while such behavior is known often to occur in chimpanzees. Finally, all the great human apes have nails & dermatoglyphics in the inner palm and digits. The palmar pattern intensity tends to be lower than nearly all other primates, and lowest in the human hand (only the gibbon and especially the tarsier have a likewise pattern intensity as seen in the human hand). The hand of an orangutan baby. SMALL HUMAN (TAILESS) APES: THE GIBBON! All 12 gibbon species (Hylobatidae, including the siamang) have the typical 'simian' digit distribution: the 3rd digit is the longest of the 5 digits. However, the hand of the gibbon is very different from the other primate species due to a deep cleft between the first and second digits - which makes their hands perfect for swinging through the trees. This deep cleft makes that the gibbon's hand hardly reminds us of the human thumb, because the gibbon thumb looks more like a low set 3-phalanged finger - where the thenar appears to be missing. 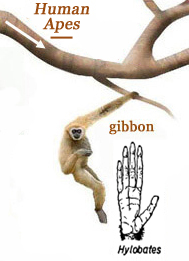 It's a characteristic that relates to one unique aspect of gibbon anatomy: the wrist is composed of a ball and socket joint, allowing for biaxial movement. Regarding the distribution of digit lengths, the gibbon usually also has a rather typical digit formula (3D > 2D > 4D > 5D > 1D). Gibbons typically have a high 2D:4D digit ratio: > 1.00 (this is a characteristic rarely seen in other primates species, except for capuchin monkeys and the tarsier). Even though the absolute length of the gibbon's (imperfectly) opposable thumb is relatively high, due to it's low setting it does not reach beyond the distal termination of the palm as seen in the human hand (+ various New World monkey species). The other characteristics seen in the gibbon hands appear to be a mix of features that are each typically seen in various primate sub-families. The gibbon's hand is very long, featured with long narrow palm that looks quite similar to the long palm typically seen in some Old World monkeys. But the gibbon's long digits remind us more of a typical characteristic seen in New World monkeys: who's digit length to palm length ratio is close to 1.0 (which is much higher than seen in Old World monkeys). The gibbon's digit length to palm breadth ratio exceeds the typical ratios seen in nearly all primate species - except for a few prosimian species (such as the tarsier and the aye-aye). Finally, the gibon has nails & dermatoglyphics in the inner palm & digits. The gibbon's palmar dermatoglyphics are typically characterized by the missing of interdigital patterns + the presence of only 1 palmar triradius; patterns become usually manifest respectively in: the hypothenar or interdigital zone 1. And the gibbon appears to be the only simian primate that has a palmar pattern intensity likewise to the human palm. 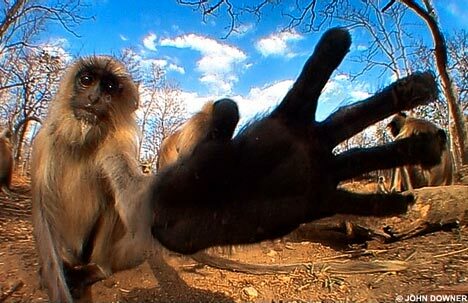 The hand of a gibbon. All 78+ Old World monkey species (Cercopithecidae) have the typical 'simian' digit distribution: the 3rd digit is the longest of the 5 digits. And baboons have the shortest digits in this primate group: baboons have the smallest 3rd digit length to palm breadth ratio. The Old World monkeys include two subfamilies which can be recognized by their hands: the Cercopithecinae (short tailed Old World monkeys including e.g. the macaque, baboon & guenon) and the Colobinae (long tailed Old World monkeys including e.g. the colobus, surili & long nose monkey). The 1st subfamily has relatively wider hands than the 2nd group; and the 1st subfamily has shorter digits (especially relative to palm breadth), a higher digit ratio & a longer thumb. Interestingly, the 1st groups usually spends their life living on the ground; while the 2nd group tends to spend more time in trees (many of these species sleep in trees and they are much more arboreal). Regarding the distribution of digit lengths, most Old World monkeys have Sorell's digit formula (3D > 4D > 2D > 5D > 1D). The Cercopithecinae subfamily tends to have 2D:4D digit ratio close to 0.86, and Colobinae subfamily tend to have a 2D:4D digit ratio close to 0.80. Most Old World monkeys have (imperfect) opposable thumbs; the thumbs than can be rotated around its axis, but they are not able to make the extensive area of contact between the pulps of the thumb and index finger as seen in the human hand. However, in the colobus the thumb is only a (not opposable) stub. Combining all these features, the hand of the baboon displays the most human like characteristics; baboons have a less elonguated palm than seen in the other Old World monkey species, combined with a 2D:4D digit ratio that is most similar the human 2D:4D digit ratio. However, finger length in baboons is significantly shorter compared to the human hand (in terms of both the breadth and length of the palm) - which concerns a similarity with the gorilla. The other Old World monkeys have a hand structure that is most similar with the orangutan; though orangs usually have shorter digits than the Old World monkeys. 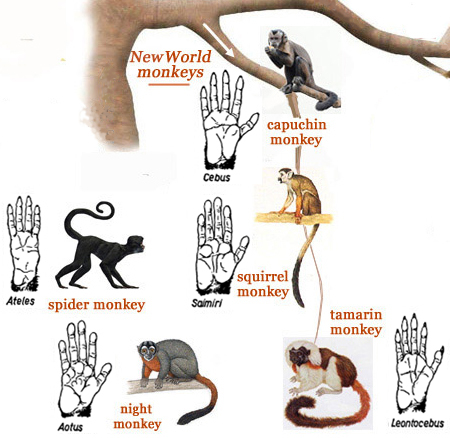 Finally, all Old World monkeys have flat nails (no claws), and dermatoglyphics in the full inner palm and digits. Old World monkeys have the highest palmar pattern intensity than all other primate families (with only a few exceptions amang the New World monkeys and the prosimians). Their interdigital dermatoglyphs are typically characterized by the presence of various patterns, usually featured with one or more whorls. 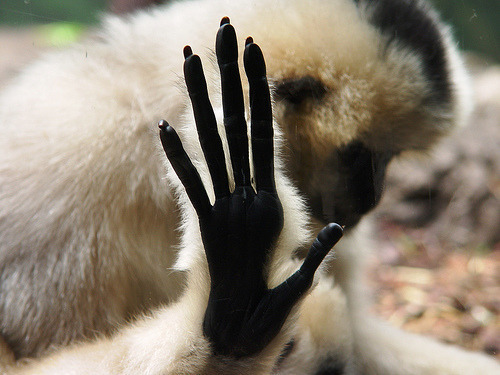 The hand of a curious langur monkey (surili related). All 53+ New World monkey species (Platyrrhini = 'flat nosed') have the typical 'simian' digit distribution: the 3rd digit is the longest of the 5 digits. Capuchins are probably the most fascinating among the New World monkey species, because they are known to have the largest brain-to-body size ratio of any primate other than humans (and are found in the TOP 10 most intelligent primates). Capuchins are capable of a limited precision grip (the ability to delicately pinch and manipulate objects with the thumb and fingertips) - which is not found in any other New World monkeys and only found in limited amounts in apes. Capuchins have the highest 2D:4D digit ratio of all primate species, which can be linked with their behavior - which is known as 'highly cooperative'. Regarding the distribution of digit lengths, most New World monkeys have Sorell's digit formula (3D > 4D > 2D > 5D > 1D). It appears that the 2D:4D digit ratio variation is relatively high among the New World monkey species, varying from possibly even up till 1.09 in capuchins to as low as 0.83 in spider monkeys (who are highly agile, 2nd only to the gibbons on this aspect: spider monkeys have been seen in the wild jumping from tree to tree). Most New World monkeys have pseudo opposable thumbs; however, in the spider monkey the thumb is only a (not opposable) stub, and tamarins & marmosets do not have opposable thumbs. Combining all these features, in the New World family the hand of the capuchin displays the most human like characteristics (especially regarding it's functional potential) - but the hand dimensions of the squirrel monkeys also have various human-like characteristics. Finally, most New World monkeys have flat nails; but for example tarmarin monkeys & marmosets are known to have claws. New World monkeys usually have dermatoglyphics in almost the full inner palm and digits. New World monkeys tend to have a palmar pattern intensity lower than seen in the Old World monkeys and the prosimians; spider monkeys appear to have the lowest palmar pattern intensity of the New World monkeys (but higher than seen in the human apes). Their interdigital dermatoglyphs are typically characterized by the presence of many patterns, often featured with one of more whorls. 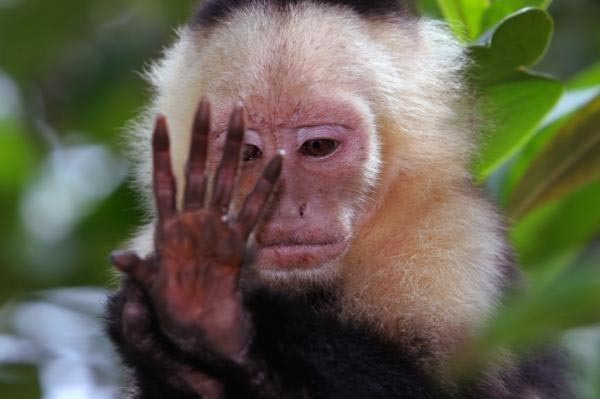 The hand of a white headed capuchin monkey. The tarsier is the only 'prosimian' primate that has a 'simian' digit distribution: the 3rd digit is the longest of the 5 digits. And the tarsier's distribution of digit lengths also matches with Sorell's digit formula (3D > 4D > 2D > 5D > 1D) - which is typical for New World- and Old World monkeys, plus the non-human great apes. However, the tarsier's digit length vs. palm length ratio is rather typical for a 'prosimian: only the aye-aye shows a likewise a-typical characteristic for a primate. The tarsier's 2D:4D digit ratio appears to close to 1.00 (though photos indicate that it may vary significantly, lower values are likely possible as well). Tarsiers do not have an opposable thumb, and they do not have a precision grip or a power grip; they are only capable to 'grap'. Finally, the tarsier has nails on all digits of the hand. But dermatoglyphics are only present in some (large) regions of the palm and at the nail phalanges of the digits. Interestingly the tarsier usually appears to have no triradii nor any loops or whorls - which is a rather untypical characteristic for a primate, and as consequence the tarsier has the lowest palmar pattern intensity of all primates. Hand features in the tarsier. 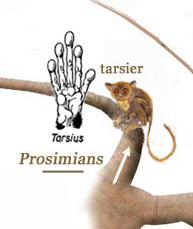 All non-tarsier prosimians have a 'prosimian' digit distribution: the 4th digit is the longest of the 5 digits. And the prosimian's distribution of digit lengths is rather diverse; many prosimian species appear to have a distribution with 2nd digit being the smallest of all digits (resulting in: 4D > 3D > 5D > 1D > 2D). However, it appears that various other distributions can be observed in prosimians (not always with the 4th digit being the longest and not always with the 2nd digit being the longest). 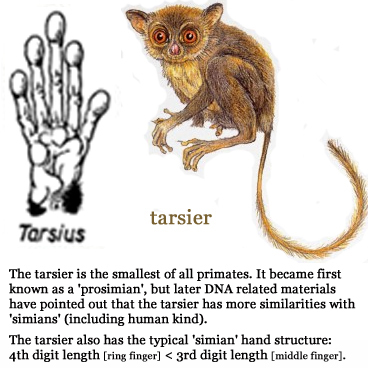 Prosimians tend to have a high finger length to palm breadth ratio; and in various species the finger length to palm lenght ratio is higher than 1.0 (which is always seen in the tarsier). Prosimians are said to have pseudo-opposable thumbs. 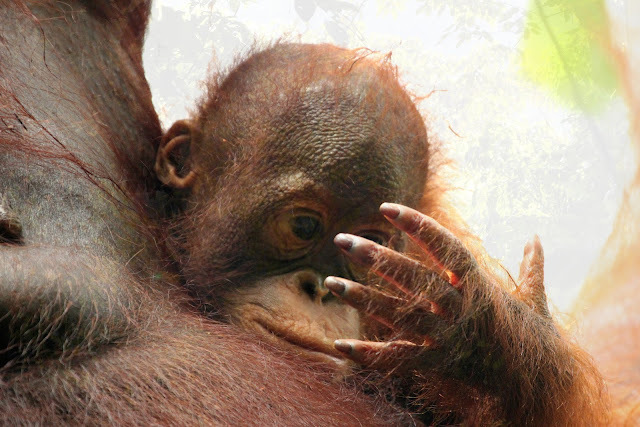 Finally, prosimians have both nails and claws (usually they have a 'grooming claw' on the 2nd digit of their feet). Each species appears to have it's unique characteristics; for example the aye-aye has a narrow 3rd digit which is used for 'grooming'. Dermatoglyphics in (non-tarsier) prosimians are only present in some regions of the palm and at the nail phalanges of the digits (often featured with whorls in many interdigital zones). And the palmar pattern intensity is in (non-tarsier) prosimians usually likewise high as seen in Old World monkeys. The hands of a lemur (4th digit is the longest digit). It's not easy to answer this question. The hand structure in dominant primates species (such as gorillas and baboons) appear to include: (1) short fingers, (2) a high palm breadth to palm length ratio, and (3) a low 2D:4D digit ratio. And the combination of these features are rather typical for male primates; which is rather interesting because in primates nearly always males to tend to dominate females. Interestingly, during the past years various human studies have indicated that low 2D:4D digit ratio tends to correlate with aggression, which can be understood as a non-altruistic manifestation of physical dominance: a male-typical type of survival strategy! And recently a HandResearch report was published demonstrating that short fingers, broad palms & low 2D:4D digit ratios are rather typical for high scorers on the Big Five personality dimension Extraversion; which is significant here because one of the six facets of Extraversion is named 'dominance' (= 'assertiveness' or 'taking charge')! Now, compared to other human apes gorillas have a low 2D:4D digit - about equal to the orangutan; but contrary to the gorilla, orangs have a longer fingers relative to palm breadth + they have very narrow palm; which could explain why orangs are far less dominant (agressive) than gorillas despite that both have a low 2D:4D digit ratio! Then, in the chapter about the New World monkeys we have seen that the 'highly cooperative' & intelligent capuchins appear to have the highest 2D:4D digit ratio of all primates - which could be linked with social intelligence: a female-typical type of survival strategy! Primatology hand studies give us a better understanding of how the human hand structure is linked with human behavior. But actually, one can sometimes even look outside the primate family to get a better understanding of the fundamentals. For example: we can find a parallel with a rather curious 'digit' feature that is typically only seen outside the primate family; because dolphins & whales are known as belonging to the most social-intelligent animals in the world (they have a fourth brain lobe). Interestingly, dolphins & whales are also known to have a very long 2nd digit in their forelimb flipper - which is a rather 'non-primate' characteristic that is actually typical for the family of the marine mammals (citaceans). Sea Sheppard Paul Watson (one of the founders of Greenpeace) have claimed that whales are more intelligent than humans, because they are they are capabile to live in harmony with the natural world! Can the primate hand structure tell us anything else about human behavior? Time will tell... but the evolutionary patterns described above indicate that there is probably a lot more hidden in the primate hand structure that correlates with human behavior. that is, of the human character. ..."